Leaping into the fray with a 2am change I opted to run Brian Kiblers take on Next Level Bant. Looking back over yesterdays results prompt a couple of observations on the deck. It has all of Junds weakness with land drops in a spreading seas rich environment. It has no life gain meaning that even though you stabalise the situation, you can not get yourself out of burn range. Vengevine requires a significant commitment to enabling creaures that it can sometimes leave you short of game. It is, however, a fun deck to play - so much so that I am not going to abandon it in a hurry. I plan on testing some more to see what modifications I can make to make it more reliable. Playing in the local FNM event playing Next Level Bant as suggested by Bria Kibler. Not in game one - long match but in the end a losing proposition. Games 2 and 3 decided in my favour by Vengevine. Punted both games badly to lose 0-2. Not my best plays of the day. Not really close - NLB seems to eat Mono white for lunch. Overall 2-1 with my loss being 100% my fault for poor play. The local store ran a second Standard event which I gleefully entered. Game 1 locked down to three lands - never close. Game 2 was a battle but in the end lost out to his power. Crushed hm in game 1. Game 2 had a slow start and died to a horde of critters. Game 3 I had too much goodness and squashed him totally. Three very close games. Gutted to lose this match,, but his deck was more consistant on the day. Two very long games - The second say a stalemate with Jason on 1 and being unable to attack for the win. Finally decided by Jace bouncing Iona, clearing the air ways for lethal damage. So 4-3 on the day. The deck is good, and Vengevine is evil, however it is not great. 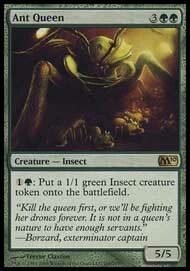 To make Vengevine work you have to commit to lots of cheap creatures. I can't help feeling that the Naya Vengevine list is stronger somehow. A recent addition to the deck box, this deck which was origionally assembled by Peter has been tuned and refined into its current form. The basic concept of this deck is to hunker down behind its walls, soaking up what ever the opposition throws at you, while sniping away with Vent Sentinals. 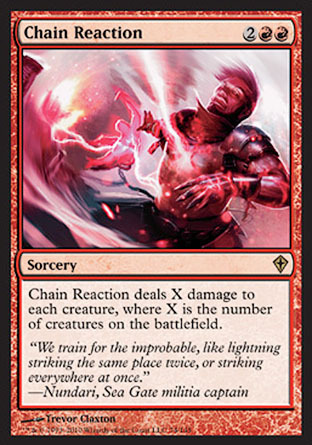 The Rage Nimbus force the weaker creatures your opponent controls to attack, leaving them open to the surprise strikes which are launched by a trio of Blitz Helions. Created the deck in MTGO for an additional $2.00! First game of 2HG saw us take down a Mythic deck .... Go you good thing! My usual payday treat! Drafted a solid B/W leveller deck with some nice critters. Round 1 v UB Levellers Won the first game on the back of Soul's Attendant, Kabira Vindicator and finsished him with Suffer the Past. Game 2 went to him as I was out pointed in a game of attrition with Consumeing Vapours tipping the ballance. Game 3, having not seen much in the way of blue I sided out 2 vendettas and promptly lost to a wave of blue creatures. Round 3 v ??? A no show for round 3 and 2 packs thank you very much! Ok, so it's not a Magic related topic, but we have a new layout for the blog - of course as it's the first time that the blog has been published I guess that this is all new! Not a wordpress based blog either, and while there are no comments available (yet), but it is a fully fledged blog with my thoughts on the state of magic listed here. Look for a twitter feed to also make its appearance in the near future. After a splurge in the secondary market I find myself in the glorious posession of 3 Sarkhan the Mad, 4 Vengevine, and 4 Lotus Cobra's. The big question that remains is how do I abuse these cards??? Vengevine is calling out to be added to Audrey II, perhaps replacing the Wolfbriar Elementals. 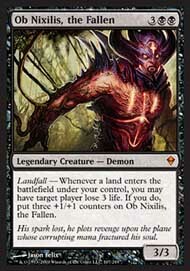 Sarkhan the mad could go into my Grixis Vampire Deck - featuring vampires, Sorin and of course Lightning Reaver. Pulled a mono green deck, with quite good mana accelleration and some nice big critters. Round 1 - I ran into a black white leveler deck and drew nothing less than 5cc until it was all over in both games. Probably should have muliganed the second game... Very disapointed in how it went. Round 2 - Transcendant Master is obscene - lets just leave it at that, shall we? Have just taken the World Queller White Weanie V1.02 deck for a spin in the casual decks area for a 5-1 record. Can't fault the performance to date. After a few 2HG games earlier today, I decided to tweaked it a little bit. I noticed that the deck struggled if I never found my Emiria, the Sky Ruins so I added a pair of Expedition Map's to allow me to search for them. Haven't tried this brew yet. Ok so it was 3 duels, and a 2-1 record with Sacrifice. The loss was in part from a missclick although I was behind and probably would not have won in any event. So that is a 7-2 record for the night - not too shabby! I played some one on one magic on MTGO tonight. 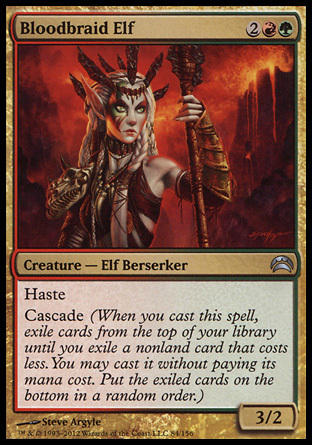 Sacrifice is an awesome deck� It has great synergy and raw explosive power that has to be seen to be believed. 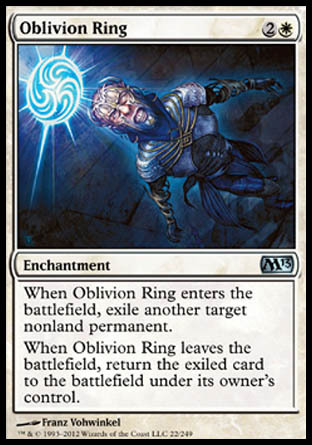 Using the Terramorphic Expanse style fetch lands are suboptimal, but still this deck has the power to get the job done. The best start was T1 Mortician Beetle, T2 Bloodthrone Vampire, T3 Bloodghast, sac Bloodghast, Expanse, return Bloodghast, sac Bloodghast, Sac Expanse, return Bloodghast, sac attack for 11. Simply Sick!!! It is almost sick enough to make me want to play this deck at FNM this weekend. It comes at you from a totally different angle and is rompy stompy goodness to the max! I also took World Queller WW through its paces for a 2-0 record. This was surprising as it was not designed for one on one. 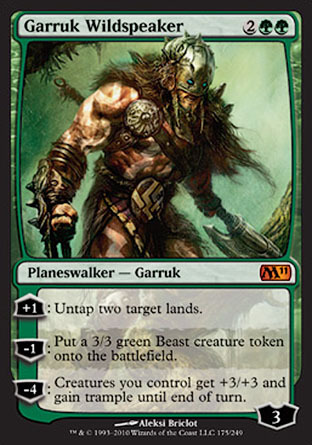 Day of Judgment and Martial Coup are unfair cards - especially if you are packing allies of green creature ramp decks. After dusting off an old list and bringing it onto MTGO I have to confess that I have been quite happy with how it has played. The original paper list featured Eldrazi Monument and Conqueror's Pledge to swarm my opponents with hordes of tokens. Rise of the Eldrazi gave us the beloved Wall of Omens and I just had to add it to the deck. In practice I have noticed that the Knight of the White Orchard has been less than stellar and so I have cut them back to only 2 copies, bringing in two copies of Martial Coup in their place.